Welcome to my site where I attempt to make a difference for cancer patients throughout the world by making time to raise money for the Pan-Massachusetts Challenge (PMC). The PMC is an 192 mile (two day) cycling event where cyclists are sponsored by individuals/companies in order to raise the money needed to fight cancer and for cancer care. I am one of those cyclists. Each sponsor's donation goes directly to the Dana-Farber Cancer Institute (DFCI) in Boston, Massachusetts via the Jimmy Fund, the fund raising arm of the DFCI. The Jimmy Fund was established in 1949. The PMC was established in 1980 and has since raised over half of the total money the Jimmy Fund has raised in donations since it's inception (over a half a billion dollars!). It is the largest sum of money ever contributed to a charity by an athletic fund raising event anywhere in the world. I got involved in 2007. By the end of the twelfth year of my involvement (the end of 2018), I had moved a total of $308,031.77 in donations. Many donations come from the same individuals who give to my cancer drive year after year. But there are many new contributors every year as well. In 2019, my goal is to raise over $20,000.00 as soon as I can and then add to that total. I would like to raise over $30,000.00! I didn't get to that total last year. The reasons to donate are many. But there are a few salient reasons to continue to do so. First, the DFCI is good at what they do, one of the top five cancer research & care facilities in the country every year. Second, one hundred percent of your donation goes right to the source, the DFCI. The cost of running the PMC (about $5 million) is underwritten by businesses around Boston. So every rider raised penny goes right to the general fund or an specific area of oncology of your choice. Mine goes directly to research.I belong to a team called Precision for Kids, the name of the team derived from the type of "new age" cancer research called precision cancer medicine. This is the first year I have belonged to this team. In the twelve seasons before, my money went to the general fund. I decided to go with the Precision for Kids team because they fund research with Dr. Katherine Janeway, a cancer survivor herself, who divides her time between working at DFCI and Boston Children's Hospital in genetic engineering. Her goal is to find the specific gene in the DNA sequence of the person with the cancer, use a localized drug that will "switch off" the gene (or replace the gene) causing the cancer and, thus, bypass the traditional use of chemotherapy and radiation and curing the patient. She has already had great success in real time with two children. This made me want to direct my donor's money in her direction. Three years ago her research wasn't being funded at all! She has made these tremendous strides of success in just two years! And, of course, the same procedure will extend to adults once perfected. Third, it's in our back yard. Fourth, the innovative work they do spills into other facilities and other areas of medicine making it better for everyone in the U.S. and around the world. Fifth, you can deduct your donation when filing your tax returns. Sixth, the more money the DFCI receives, the better able they are to hire the best people (researchers/doctors) to do the job. This will continue to make them the best to support. Seventh, individuals I know are now cancer free because of the good work at the DFCI. Thank you all so much for supporting me in this wonderful event. It's the event of a life saved for many of those people with the disease. And cancer won't go away unless someone gets involved. I am just one of the many (over 6400 riders last year) who believe in this event. And, last year, this one cycling event raised over $56,000,000.00! The total money raised since the PMC's inception, in 1980, is $654,000,000.00! And that figure was posted in November. Since then other donations have been received and more will be sent as you are reading this sentence. The event has many rides. Mine, the longest of the few available and the original ride, starts in Sturbridge at 5:30 AM sharp on Saturday, August 3, 2019 and ends, on the first day, 111 miles away at Bourne, Massachusetts at the Massachusetts Maritime Academy (where we will be spending the night). 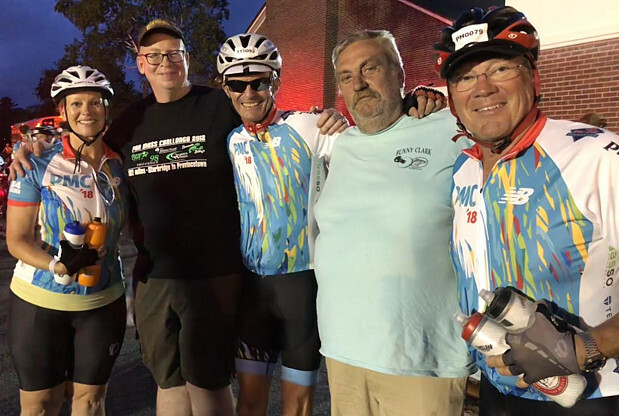 The second day starts at 6:00 AM (or earlier - depending on the rider) on Sunday, August 4, 2019 and ends, 81 miles away, in Provincetown, Massachusetts. I have a ticket for the slow ferry that leaves Provincetown at 3:00 PM and arrives in Boston, Massachusetts sometime before sunset. Once in Boston, I will get my truck (or, lately, it has been in my dory mate, Hez's, vehicle) and head home. 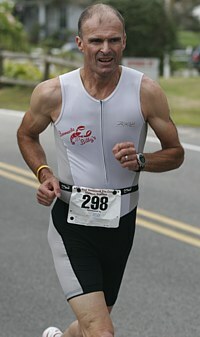 I am sixty-seven years old, a life long endurance athlete and an avid deep sea party boat fisherman/captain/owner and President/General Manager of my family's restaurant business in Perkins Cove (Barnacle Billy's, Inc.) Ogunquit, Maine. I chose the PMC as my first pick for a fund raiser because of the cycling but also because I wanted to be a part of the largest one event sports related fund raising drive for cancer in the world. But, like a good ship, I need a good crew of donors to help me make this something special. And, if you know me, I don't do anything half baked once I make a decision to do something. I am asking for your help in contributions to make this thirteenth try a better fund raiser than the first twelve. Also, keep in mind, the amount donated is not the most important thing, although the more the better. But the number of donors is very important indeed. I don't care how large or small the donation is as every bit of money will help cancer victims in some way. If you, as a donor, want to make your contribution anonymous, write this as a note with your check and it will be so. Otherwise, donors and donations will appear below. This list will be edited as soon as I am able with your contribution added in order of the date on the check or the date I receive the check. Thank you in advance. The shot above is a digital image that was taken at 5:00 AM in front of the Host Hotel, Sturbridge, Massachusetts on August 4, 2018, a half hour before the start of the longest PMC ride. This digital image has much history. Since the first PMC ride that Hez and I attended together, Steve LaPlante, Hez and I have always had our picture taken together at the start of the event. Steve, the individual in the black Bunny Clark/PMC shirt, drives up from Connecticut so he can be there at 4:30 AM on the first day of every event I have ever attended. It's easy to find him, even with hundreds of people roaming around; he is taller than all of them! Since our original picture was taken, others have made it a point to make the start as well, including Dave Miller, pictured in the light blue t-shirt. Dave has been one of my fishing customers on the Bunny Clark (as has Steve) for many years. Also appearing in the digital image are Abby Mitchell, my niece (who also rode in the event), far left, yours truly (third one in) and my best friend, Hez, at the far end, right hand side, holding two water bottles. Sometimes I feel that this is the most special part of the trip, when we are all together before the event. It's an exciting moment with individuals who I respect greatly and love dearly. A digital image of me, Tim Tower, taken at 10:00 AM, August 6, 2016, fifteen miles from the finish of the first leg of the PMC ride from the Sturbridge to Provincetown route. This leg stopped at Mass Maritime Academy where we would stay over night in the dorms there before the start of the next day. At the time the shot was taken, the photographer was lying prone on the right hand side of the road. I was the second rider to pass him. But I lost my place when I stopped to fill water bottles at the next water stop. As is customary on the first day, I am wearing the full 2016 PMC kit with matching socks. Tim Tower as seen during the running leg of the West Kennebunk Fire Company Triathlon on Aug 26, 2006. Tim Tower as seen during swim/bike transition during the West Kennebunk Fire Company Triathlon on Aug 26, 2006. After the swim, the bike is taken (running) with the shoes already clipped in. 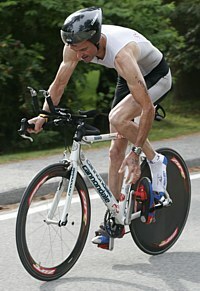 In this image, Tim has already mounted the bike (which is moving at 10 mph), the right foot is in and he is in the process of getting the left foot in the shoe. CORPORATE SPONSORS: Bunny Clark, Corp., Barnacle Billy’s, Inc. and Chamberworks - Excellent web page design! The shot above was taken on August 5, 2018, five miles from the finish in Provincetown, Massachusetts. I had chosen to ride the last fifteen miles with a team called Precision for Kids, the same team (all with the same riding kits) that I have decided to join and direct my fund raising. Many of the members of this team I had befriended in 2007, the first year I rode. At that time their money was going to the DFCI's general fund, the same as mine was. 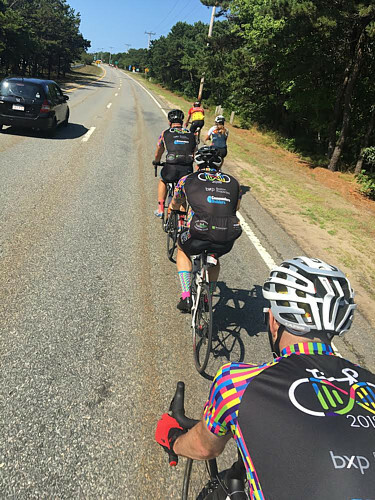 In the picture above, for this last leg of the ride, the team and I formed a fast train, just a few of us, and, basically, raced until the end. Our average was up around 22 mph or a little more. I know that I led for seven miles of it paying attention to staying just above 20 mph and holding this as a steady pace. It was very fun and something I thought I might miss by taking a different approach to the weekend this year (trying to stay away from racing/crashing). I am a bit competitive. And this kind of ride feeds that spirit. Above is a shot of "the train" with me just a bit to the outside as the fourth wheel holding the camera/phone high above my head. We are passing two riders on the right. The lead of our group is Bryant Mitchell, Abby's husband, who took Abby's place half way through the first day when Abby developed bike problems. The rider just ahead of me is new to the group this year. His name is Fred Stallings (NY). His sister, Katie, has ridden the PMC for years. 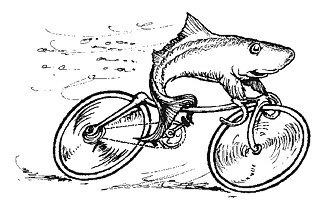 Fred is very fast, an excellent rider. We had no weak links in this group. The last two miles we carried an average speed of 25 mph racing along side another team. As we rode through the long entrance path to the finish I couldn't help thinking how fast this weekend goes by. I think this image captures the excitement and comradery part of the ride that I have come to enjoy.